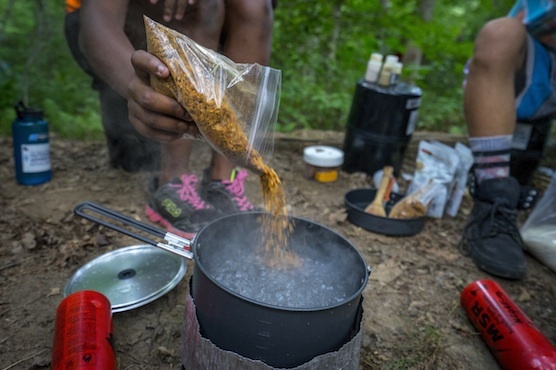 Some veteran backpackers claim the only time a heated can of Dinty Moore stew tastes delicious is when eaten outdoors, but today there are many quick and easy ways to pull together a gourmet meal from what you can grab out of your backpack. The trick is knowing what to pack! Truth is, we here at The National Center for Outdoor & Adventure Education (NCOAE) are among the go-to experts when it comes to wilderness cooking for large and small groups that enjoy the backcountry. That’s because our veteran field instructors and leaders have had years to develop ways to transform mundane mountainside meals into Five Star (OK, maybe Four Star) dining experiences. The secret? It’s all in what you pack in your gear. And with some advance preparation and careful planning, you can spice up your wilderness menus to taste just as delicious on your weekend trail trek as they do for us on, say, an Outdoor Educator Course in Patagonia.